A pair of grand old maple trees covered with a thick coat of moss in Scappoose, Oregon. The trees have shed their leaves for the winter, but the moss creates a colorful palette of vibrant greens from recent rains. 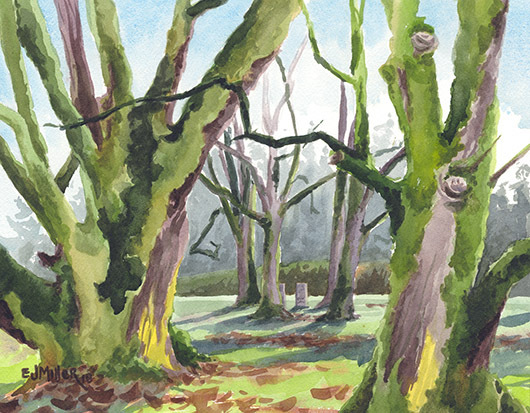 Beyond the maples, three graves stand in a row, sheltered by a circle of four old mossy oak trees. Were the trees planted in honor of the graves, or was the grave site selected as a peaceful spot between four young trees? This homestead dates back to the earliest days of Scappoose pioneer settlement, with the grave sites marked from 1847 to 1852. Buildings were still standing on this site until the 1960s, but now only the mature trees and grave sites remain.